Stalker's SAM trailers are powered by Precicion Solar Controls and feature Stalker speed measurement accuracy in a rugged, dependable trailer platform. Legible at up to 1000 ft.
4D Deep Cycle 12-Volt Batteries. Provide over 18 days of continuous operation yielding longer operation time between battery charges. Provides all programming and diagnostic fuctions. 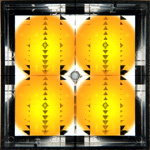 At the heart of the Stalker SAM is Precision Solar Control’s LED Lamp Matrix and LED Pulse Width Modulation. The LED Lamp Matrix concentrates and focuses the LEDs’ light, allowing the motorist to see the sign at a greater distance and, thus, act on the speed warning quicker. LED Pulse Width Modulation significantly increases the time between battery charges and powers the LEDs so that they remain at a consistent brightness throughout the battery‘s discharge cycle. 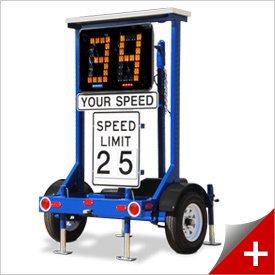 The speed measurement component is pure Stalker - accurate and durable. The dedicated hand-held controller provides complete programming and diagnostic functions in the palm of your hand. A wireless version of the same remote is also available. Heavy duty marine batteries provide up to 18 days of continuous operation yielding longer operational time between battery charges. The trailer maintains a neat and professional department image, while its all steel construction provides a sturdy platform and reduces damage sustained in the field. Telescoping jacks provide enhanced stability and easily fold up and away for travel. Once positioned, the tongue is hinged to swing up and out of the way. It is also removable. 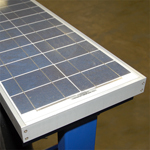 The solar panels recharges a day’s worth of battery use with only 2.5 hours of sunlight allowing for long-term field operation. 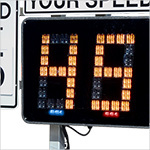 High powered LED Violator alert flashes to warn motorists when they heve exceeded a pre-set speed. Three different user-programmable settings and a choice of red/blue or white/white LEDs. Easily gather valuable traffic data for improved grant writing support and verification of the sign’s impact on traffic speeds. from the Stalker Traffic Statistics Sensor.